In the first chapter we had an exercise with learning how to modify code. I enjoyed this exercise because it made perfect sense to me. Mostly it meant editing the HTML or CSS inside of the code and I already have a familiarity with those. 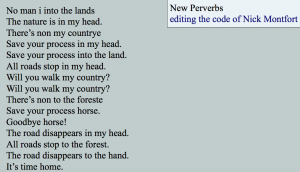 For my project then I messed around with the Perverbs site changing different parts of it. I started with the most basic element changing the words of the original code and put my own words in. I also tried to understand the code around the words and how it knew how to organize them. I noticed that the very last letter in the first variable was tacked on to the end of the second variable in the compilation. The last letter then was always just punctuation. However I decided to omit punctuation in a few cases to see the weird phrases that the code could spit out and how that changed the meaning of those phrases. As a part of the exercise in the book we were supposed to find the variable that controlled the speed of the text that was generated after a few tries I found the correct variable and slowed down the speed to 8000 from the original 2500. While that was the main parameters of the exercise I continued to play around with the code a little bit. I changed the font of the generated text and it’s size. I also switched up the colors of the background and the background color of the text box in the corner. I also changed the text inside that text box. Below is a picture of what the outcome looks like for the New Perverbs page.